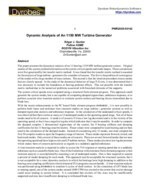 This paper presents the dynamical analysis of an 11 bearing 1150 MW turbine-generator system. Original studies of this system yielded information on the system critical speeds and mode shapes. These calculations were first generated by the transfer matrix method. It was found that the transfer matrix method is unsuited for the analysis of large turbine-generators for a number of reasons. The first is the problem of convergence of the modes with a large number of mass stations. The second is that the iteration procedure misses modes that are closely spaced. In the study of the dynamical behavior of large T-G sets, it was determined that it was necessary to include the foundation or bearing pedestal effects. This not possible with the transfer matrix method due to the numerical problems associated with branched elements of the supports. The system critical speeds were computed using a structural finite element program. This approach could generate the system modes, but is not capable of computing damped eigenvalues, unbalance response, or to perform accurate time transient analysis to evaluate system motion and bearing forces transmitted due to blade loss. With the recent enhancements to the PC based finite element program DYROBES, it is now possible to perform both linear and nonlinear time transient studies on large turbine-generator systems as well as damped eigenvalue analysis and unbalance response. In the calculation of the undamped critical speeds, it was observed that there can be as many as 12 undamped modes in the operating speed range. Not all of these modes need to be of concern. A mode is of concern if it has a low log decrement and is in the vicinity of the operating speed, or that it has a negative log dec which indicates that it may be unstable. In order to compute the damped complex 3 dimensional eigenvalues of the system, the 8 bearing stiffness and damping coefficients for the 11 bearings must be known. These values were computed for each bearing and are then used in the calculation of the damped modes. Instead of considering only 12 modes, one must compute the first 30 complex modes to span the frequency range of interest. These modes represent forward, mixed, and backward modes. Only several of these modes are of concern. There are several forward modes that are near the operating speed and have high exciter and LP turbine motion. These modes also have low log decrements which makes them of concern particularly as regards to a suddenly applied unbalance. A time transient analysis is required in order to access the T-G response at running speed due to a sudden unbalance such as caused by blade loss. One of the limitations with structural finite element programs is that transient analysis is accomplished by assuming a set of undamped modes. One is then required to assume a percent of modal damping for each mode. This approach may be acceptable for structural systems, but it is not acceptable for a rotordynamics analysis in which the bearings have high damping in addition to the bearing cross coupling coefficients which structural FEA programs cannot handle. A time transient analysis was performed using DYROBES to simulate 6 cycles of shaft motion. In this simulation of LP 3 blade loss at running speed, one of the system modes around 1600 CPM was excited to the extent that exciter damage could occur leading to system failure. It is concluded that exciters of this class may be insufficiently supported and also have insufficient damping to withstand blade loss.